Iaido has very old roots in the Japanese martial arts.In the latter half of the fifteenth century, Izasa Ienao founded the Tenshin Shoden Katori Shinto Ryu, a school that devised the dynamic art of iai-jutsu. There were over 200 ryu (~school) founded that are primarily concerned with sword-drawing techniques in the afterglow of this amazing and inspirational man. Iaido was formed only after World War II when a series of ten kata (~forms) were chosen, out of four koryu, called seitei kata. Iaido is a way of defending and attacking with a real sword. You can see it as an equivalent of the cowboy’s fast gunfighting. Iaido is most performed in kata in which attack and defence are prescribed. Because of the danger of injuries, iaido is practised single with a imaginary opponent. The sword was seen as the soul of the samurai and was therefore a sacred and very respectable weapon. 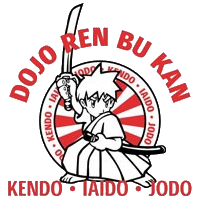 In our school Muso Shinden Ryu and Hoki Ryu are the two ryu mainly practised. Would you like to watch an iaido movie? Click to view. Jodo is a powerful art, in which a jo is used against a swordsman. The jo can be used to strike like a sword, sweep like a naginata, thrust like a spear (yari). Its two ends can be used, unlike the single point of a sword, and its ma-ai (fighting distance) can be varied according to the hand grip you take. Because of its speed and changeable ma-ai, it is a formidable weapon in the hands of a skilled master. There are 12 kihon, which also form the basics of the modern Zen Nihon Kendo Renmei Jodo-bu (All Japan Kendo Federation Way of Jo Section). There are also 12 omote waza ("outward" forms), 12 chudan, 2 ran-ai, 12 kage, 6 samidare, 5 gohon no midare, and 12 okuden ("secret" forms). Students begin with tandoku renshu (single practice), in which the basics, or kihon are performed solo. This is followed by sotai renshu, practicing in pairs, in which one person assumes the role of a swordsman against a jojutsu person. The proper attitude for practicing kata is that all attacks are characterized by relaxed movements and postures, maximum focus of energy being applied only at the actual moment of impact. This allows maximum efficiency of movement and conservation of energy and also provides the trainee with a critical margin (yoyu) to be used in the case of something unforeseen occurring. Beyond technique, however, there is a poem from the oral tradition that admonishes the student to: ". . . Concentrate on being a person who causes no injury to others. Our teaching is: In the heart of the jo is an arrow." Kendo is practiced with bamboo swords. The bamboo sword ("shinai") consists of four loose strips of bamboo that are held together by a leather handle and tip. This shinai is used to strike the head (men), the right wrist (kote), the right side of the trunk (do) and the throat (tsuki). These body parts are well protected by a number of outfit parts. The head is protected by a helmet ("Men") which consists of a steel grille and a solid material edge. To protect the throat a hard throat flap is attached to the Men. A hard chest cuff ("Do") protects the body from strokes. The wrists, and finally, are protected by sturdy gloves ("kote"). This equipment, in combination with the strict conditions with which all techniques have to comply, ensures that Kendo is a relatively injury-free sport. Kendo actually consists of 4 basic techniques: the battle to the head ("men"), the battle to the right wrist ("kote"), the stroke to the right side of the trunk ("do") and the strike to the throat (" tsuki "). The blows are accompanied by a loud scream ("kiai") with which the kendoka regulates his breathing, puts the opponent under pressure and focuses his energy. The importance of controlling these basic techniques is expressed, for example, in a competition ("shiai") where a hit only yields a point if the technique is correctly executed with the correct attitude and purposefulness, and accompanied by a kiai. Accidental hits and poorly finished shots do not yield points. A shiai lasts 5 minutes. The kendoka who scores 2 points first, wins.